The Pearl FFXPMD Championship Medalist Pipe Band snare drum features a full free-floating shell formed with Pearl’s Superior Shell Technology and a precision cut snare bed for the ultimate in snare response. Available in 100% Birch 4-ply shells, with 2-ply reinforcement rings and a high strength Aluminum edge ring for high tension. The high strength lightweight aircraft Aluminum edge ring offers extreme durability under the most aggressive tuning. Pearl’s Quick-Release Snare System allows the removal of the entire snares with the turn of a knob for super easy head changes. The upper snare unit uses a 28 strand chrome-plated carbon steel snare that features exterior adjustability over tension and head contact via a standard drum key. Available in a variety of high-gloss UV lacquered shell finishes. Premium shell finishes are also available. 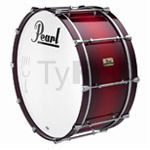 The Pearl Pipe Band Series bass drum is designed to provide huge low frequencies with resounding warmth and definition. The 4-ply Maple shells with 6-ply 1.5” Maple hoops have polished Aluminium tube lugs for improved shell resonance and reduced weight. 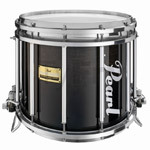 These bass drums are scientifically engineered by Pearl to provide the ultimate in bass response and projection. 26″ x 12″, 28″ x 12″, 28″ x 14″, 28″ x 16″ and 30″ x 16″. 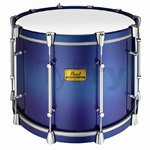 The Pearl Pipe Band Series tenor drum is the perfect compliment to the Pearl FFXRK pipe band snare drum. The shells feature 4-ply Maple with 6-ply Maple hoops and polished Aluminium tube lugs for improved shell resonance and reduced weight. The case-hardened tension rods provide consistent head tensioning and the top and bottom heads are independently adjustable. 14″ x 12″, 15″ x 12″, 16″ x 12″ and 18″ x 12″, 20″ x 14″ and 22″ x 14″.